Apple CEO Tim Cook visited Trump Tower along with other prominent tech executives on Wednesday as they gathered in New York for a summit with U.S. President-elect Donald Trump, who was accompanied by three of his adult children. According to The New York Times, the meeting was attended by 11 other tech executives, including Alphabet's Larry Page and Eric Schmidt, Facebook COO Sheryl Sandberg, Amazon CEO Jeff Bezos, Microsoft CEO Satya Nadella, IBM CEO Ginni Rometty, and Tesla's Elon Musk. Vice-President-Elect Mike Pence was also at the table. 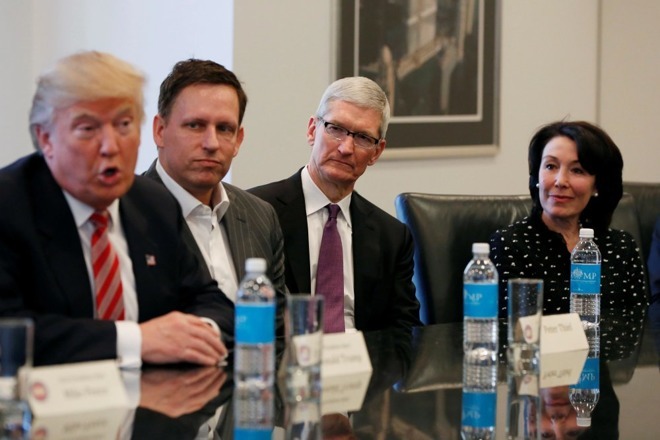 Cook sat two seats away from Trump, beside Facebook board member and Trump transition official Peter Thiel, and listened as the president-in-waiting began by heaping praise on the executives in the room. "This is a truly amazing group of people. Anything we can do to help this go along, and we're going to be there for you… you'll call my people, you'll call me – it doesn't make any difference, we have no formal chain of command here. We're going to do fair trade deals, we're going to make it a lot easier for you to trade." According to The Wall Street Journal, executives were then invited to introduce themselves one by one. "Tim Cook, very good to be here," said the Apple CEO. "And I look very forward to talking to the President-elect about the things that we can do to help you achieve some things you want." A number of issues were discussed once the press were ushered out of the meeting room. According to several executives who attended the meet, topics included trade, immigration, and vocational education – the latter being one of the main reasons Cook has previously given for why most Apple products are made in China. Trump has rebuked Apple in the past for basing the vast majority of it assembly plants in other countries. While campaigning earlier this year, Trump said "we're going to get Apple to start building their damn computers and things in this country instead of in other countries", while he has also threatened to introduce a 45 percent tax on products imported from China. According to USA Today, Trump also told executives at the meeting that he planned to slash the corporate tax rate in the U.S. in order to make it a lot easier to repatriate money kept overseas. Referring to his commerce and economic administration picks, Trump said they would "make it easier for you to trade across borders, because there are a lot of restrictions, a lot of problems". He added, "If you have any ideas on that, that would be great." The meeting reportedly ran for two hours and included "productive discussions about job creation and economic growth", said incoming White House Chief of Staff Renice Priebus. At the end of the summit, Trump suggested, and tech leaders agreed to, meeting quarterly, according to a person briefed on the meeting. Cook was a Hillary Clinton supporter during the election campaign and hosted a fundraiser for the Democratic presidential nominee in August on behalf of himself. In a company-wide memo issued following Trump's victory, Cook urged Apple employees to "move forward together" despite "uncertainties ahead". Tim to Donald: "let's make America thinner!" Why on earth were Trumps children at this meeting??? Aren't they running his businesses??? Trump will go down in history as the most corrupt president America has ever had. Tim does not look happy to be there, the look on his face says it all. I'm most definitely no fan of Trump, but I have to admire this kind of approach. It's very unusual, seems like a break in protocol from the norm, and he just want to cut red tape to help businesses do better in the USA. It'll certainly be an interesting couple of years. He's done more in 1 year for our international deals, climate change initiatives and started the ball rolling on reforming our drug policies, electoral reform, rolling back Harper era unconstitutional laws, all while taking selfies. He hasn't even started yet. And not sure what you're defining as "corrupt". Give the man a chance and see if he falls on his sword. Not all Canadians feel this way. Right you are. Many Canadians are delusional. Those that are, still apologize for Trudeau. Face it, you elected the Obama of the North, but unlike Americans you actually had years and years of real-life observation of Chicago Jesus and still went for it.